It's finally Friday. Isn't it so hard going back to work after being off for 5 days? It was for me. But we survived our first week back. Plus it is December 1st which means all the Christmasy things are in full force! I LOVE IT. ONE. We wanted to introduce the girls to Elf on the Shelf this year, but I didn't want to move him daily and do a random scheme each night. Maybe when they are older. Our goal with the elf was for him to watch over the girls and report back to Santa. Just like most elves do. But our goal is for our girls to give the elf all of their pacifiers on December 20th, so he can bring them back to Santa to give to all the babies, boys and girls who need them since our girls are getting to big for that. And in return, the elf will give them a present the next morning. We wanted to do this on the 20th, so we don't have three days of hell on Christmas Day. I got them the Minnie Happy Helpers House as their gift if they can give their pacis up. Fingers are crossed. TWO. Speaking of the Elf on the Shelf, we are introducing him to the girls tomorrow morning. I have bought each a pair of Christmas pjs, a Christmas book, two dollar spot Christmas cardboard books and Christmas Minnie socks. We plan to grab some donuts from our favorite shop bright and early on Saturday morning and have it all set up for the girls when they wake up Saturday morning. I also wrote them each a card that is from their elf Giuseppe. That is what we named him. Well what Rory name him and I think it is cute. Are you doing a North Pole breakfast to introduce your elf? THREE. Last weekend we cut down a Christmas tree and the very next evening I made my husband put it up. I usually have it up by that Sunday, but since we were out of town, we didn't get our tree until Sunday. Once you cut the tree, you should let it sit for a day or two to let some sap drip off, to get rid of any bugs that may have tagged along and that is just what I was always told to do. I couldn't wait any longer, so on Monday I asked my husband to put it up. Funny thing is, we had to cut off a ton to get it to fit in our house (ala Clark Griswold style), but it looked soooo beautiful. That evening I also put up the lights on the tree which took a couple tries as this is a different kind of tree than I am used to. We usually get a pinion pine and this one isn't. But after starting from the top and working my way down, it was perfect. Tuesday night the girls and I added ornaments to the tree. And when I say the girls and I, I mean they put up two ornaments and then I put up the rest while they admired those two ornaments (both of them were their ornaments). FOUR. Remember how I said I would review my Instant Pot after I used it a few times? Well, I have an update for you all. I LOVE IT. I have made mushroom risotto, mushroom and wild rice soup and chili garlic noodles. They were all good and soooo easy to make. 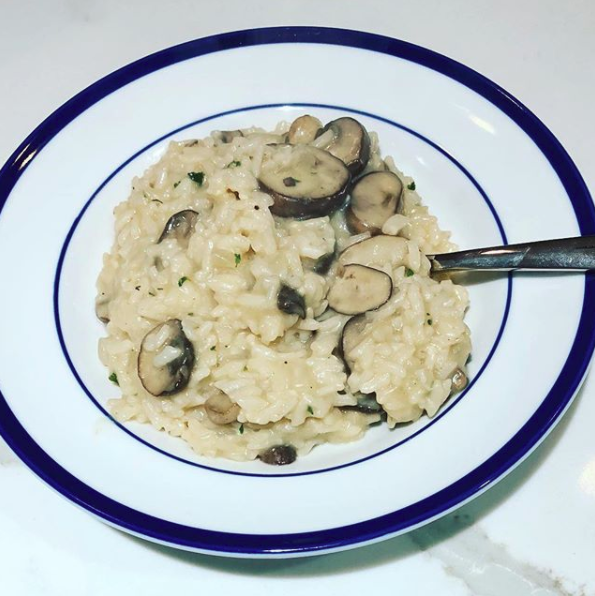 I was a bit worried about the mushroom and wild rice soup since it said to cook it on manual for 45 minutes which seemed like a long time when this is supposed to speed up the process, but nope, it was perfect. I plan on making Skinny Taste's Spaghetti with Meat Sauce this weekend and another recipe for when we have company over on Monday. While I wasn't sure how to use the Instant Pot when I first got it and was a bit confused by the instructions, I quickly learned how to use it. Tip: do the learning cycle (you only use water in it), so you can familiarize yourself with how long it takes to heat up, how to put the lid on properly, the releasing of the vent and the manual vs. options cooking. So far I am loving my Instant Pot. FIVE. A few weeks ago I posted some sugar cookies that I absolutely loved. We made them several times and then made them without the pumpkin and they were just as good. 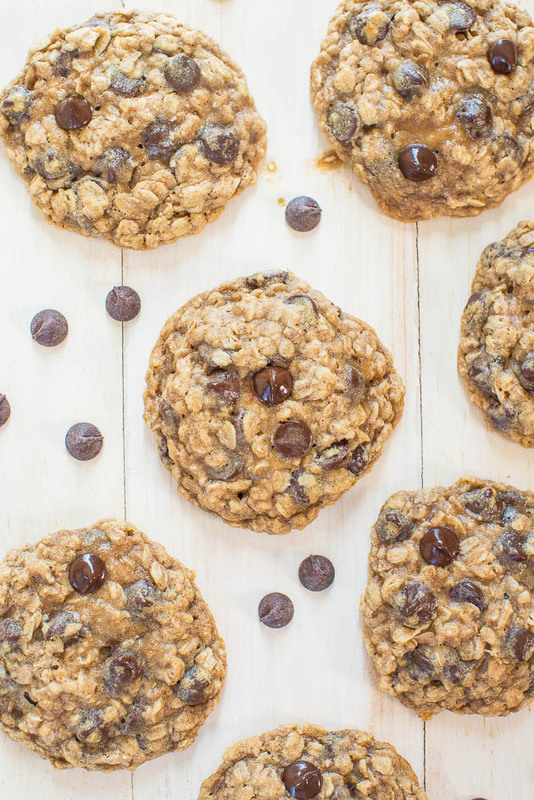 But this week, Rory asked me to make him oatmeal cookies with chocolate chips and no raisins. Done. I searched Pinterest as I always do and found the most promising cookies. Sure you have to chill them for at least two hours, but I can't wait to make them and taste them. I am definitely adding nuts to them since he doesn't want raisins. This is the recipe I am using. We are doing our north pole breakfast this morning! I can't wait to see the boys reaction...im sure it will be a letdown as usual hahaha. Great idea about the paci's, I may do the same thing! Jack has got to get rid of his!! Have a great weekend friend! Our elf always does a send off breakfast on Christmas Eve but next year I think I want to change it to when he arrives. The girls are going to love him! I love your tree!!! I love the pacifier idea! I hope it goes well! What a fantastic pacifier idea! We were so much more mean with Spencer haha we cut all the nips off, and he had 3 days of great sadness before getting over it haha BUT it worked out! Those kiddos are going to love the Minnie house! Your tree looks gorgeous! I love that you are using the elf to get rid of the pacifiers - such a great idea! Oh, those cookies look so yummy! I'm glad you like the Instant Pot - I'm secretly hoping Santa brings me one. Your tree is beautiful!! We have always had an articulate tree but a real one seems so much more special. Not sure how I'd feel about the bugs. Haha. I kept waiting for you to say something crazy happened since you put it up right away. 🤣 Have a good weekend! I love the elf's name and your plans to introduce and the pacifier give up plan. I hope it is all success! 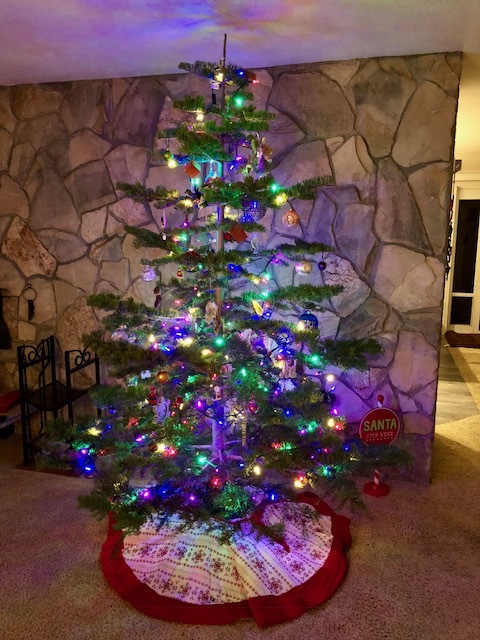 Your tree looks great! I buy mine from a lot pre cut so I put it up stat, which I plan to do Sunday! First off, I want those cookies! Second, we told Ben that Santa took his pacifiers to give to other babies and it worked really well. I know each kid is different, but he seemed to accept that as a logical reason, hahaha. Good luck! Your tree is gorgeous! Oh these freeze well. I made them this weekend and I put the extras in the freezer. But I am sure they will be baked this week. Ha. Our breakfast did go well. Soooo cute. I am so intrigued by the Instant Pot... I see so many amazing recipes for it. What a great idea to use the Elf on the Shelf to take away the pacifiers! And how smart to think ahead and have him take them before Christmas, so that it's not complete chaos! Your tree is so pretty! I love the pacifier idea, good luck! And I think that's the best elf name I've seen! Your tree looks so pretty!!! Good luck with the pacifiers! I dread when it comes time for Zoe to ditch hers. She wasn't super dependent on it the first few months of her life, but she has become much more into it around the 5 month mark and she looks for it throughout the day now. I remember when my sister was little, she dropped hers off our porch and there happened to be a bird at the time and my mom told her the bird took it and that was it. She understood and was done. I love the idea of the elf taking it and bringing a present. Zoe got her magical wand castle yesterday and she is obsessed! It is very similar to the minnie one. I am sure your girls will love it! 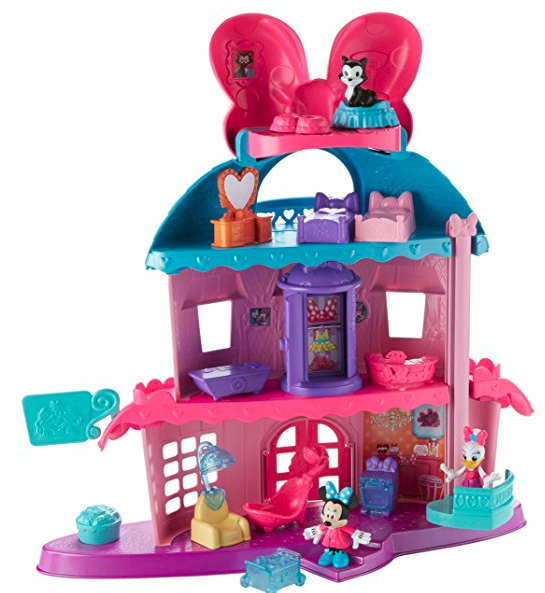 I got my older one that Minnie house for Christmas! Hope the girls give up their binks! I have a feeling my little one is gonna have it for a while.